I will never forget Angry Snow White. Somewhere along the way she had snapped. Could it have been consuming one too many apples, making one too many unmade beds, serving one too many grumpy dwarves, or maybe it was taking one too many photos with tourists? Seconds after this shot was taken, Snow took those scrubbing hands of hers and sent the girls flying forward with a shove and a sickly sweet high pitched, "Have a nice day!" They caught themselves from hitting the pavement and looked at me with large surprised and amused eyes. "Um... Mom? 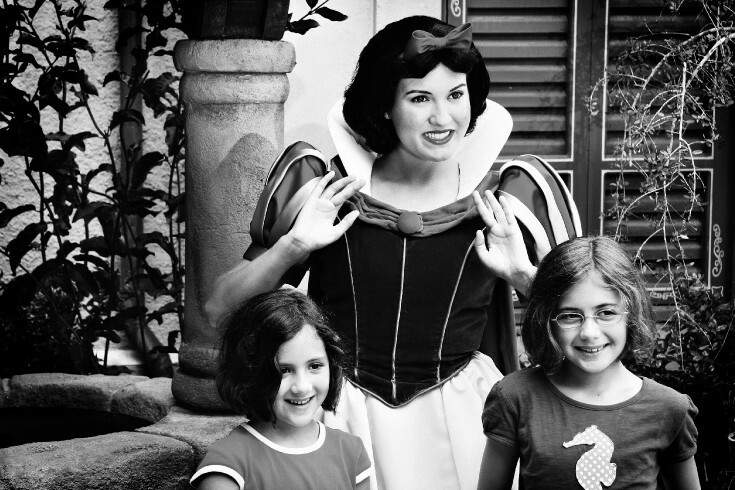 Snow White just pushed us!" We could have been angry, but we chose to laugh. At their young age, they were able to see the humor in the situation and know that sometimes even Snow White does not have a very nice day. At my older age, I could feel her pain from dieting on fruit, making those endless unmade beds, dealing with grumpy short people, and snapping a million photos. A girl has got to get her fun somewhere!